LONDON, 12th May, 2015/PRNewswire/- PR Newswire has successfully integrated media targeting, distribution, monitoring, reporting and ROI results into its Agility platform, providing users with an improved workflow and more comprehensive results. These are the latest updates as part of PR Newswire’s overall development strategy to make consistent enhancements to the Agility platform, driven almost exclusively by customer feedback. Agility’s monitoring capabilities now include enhanced metrics and the ability to analyse trends to better inform future campaigns. Visibility Reports from newswire distribution and email ROI reports are now consolidated so that clients can see the success of their wire and email campaigns in one place. Email ROI has also been improved to show valuable information on delivery success and open rates of emails, links and attachments. Another addition is that users of Agility’s monitoring service can now monitor UK copyright-protected articles from NLA media access, providing access to the online content from 1,400 national and regional newspapers, over 750 magazines and 1,100 + news websites. With access to NLA’s content, licensed clients will be able to see where they’ve been mentioned across key UK publications, a critical component in measuring the success of their campaigns. Agility’s new dashboard offers several new ways to customise data to make tracking and managing campaigns easy from one intuitive interface. By dragging and dropping customised widgets onto their Agility dashboard customers can keep an eye on several key topics and access monitoring and targeted email distribution reports to help them identify and participate in conversations around their brand. Each user on an account can personalise a dashboard so team members can narrow their focus to the information that matters most to them. PR Newswire’s Agility platform is a powerful tool built to evolve with the industry it serves, developed in an agile manner that provides rapid and flexible responses to the needs of customers. Agility enables users to monitor topics across the web through interactive graphs that display topics over a period of time. Social posts, news articles, and blog posts are fed directly into a system that allows marketing and PR professionals to immediately engage with the content and influencers. PR Newswire’s journalist and influencer database is the most extensive in the industry. Agility’s targeting tools help users to research previous articles, biographies, contact preferences, social profiles and even Klout scores to help identify relevant journalists, bloggers and media outlets. Agility allows users to easily distribute news releases, newsletters, and announcements. Subscribers can access PR Newswire’s industry-leading content distribution network, or build customised media outreach lists, personalised with recipient contact names. The ability to demonstrate ROI is always top of mind for PR and marketing professionals, and with Agility, users can prove value and understand the impact of their communications efforts with elegant reporting. Customisable and shareable reports measure activity, engagement, sentiment and media trends to help understand the full impact of a campaign. You are invited to learn more about PR Newswire’s Agility platform: Click here for a demo request. PR Newswire (www.prnewswire.co.uk) is the leading global provider of PR and corporate communications tools that enable clients to distribute news and rich content across traditional, digital and social media channels in real time with full actionable reporting and monitoring. Producing, optimising and targeting news and content across the world’s largest multichannel distribution network and offering the most accurate and frequently updated opted in journalist databases for over 60 years PR Newswire has a truly global reach serving clients across EMEA, India, the Americas and Asia-Pacific. Imogen Powell-Shaw, Marketing Manager - EMEA and India, PR Newswire. Desktop video conferencing is rapidly on the rise. Businesses are now increasingly understanding the tremendous power offered by enterprise desktop video conferencing, and now this technology is no longer viewed as something that is simply nice to have but has become a vital element of any organization. Today’s increasingly disparate workforces often experience struggles with the ability to find time to connect and collaborate in a face-to-face manner. With businesses increasingly located around the far flung corners of the globe, face-to-face collaboration often means juggling schedules and dealing with exorbitant travel costs. 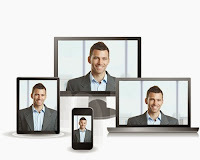 Even so, with advanced desktop video conferencing solutions, such as those offered by R-HUB web conferencing servers, employers are now able to ensure that employees are able to connect with one another regardless of their location. Businesses can also leverage web conferencing to meet with clients from around the world, a tremendous advantage in today’s growing global economy. At one time, proximity was the most vital element for connectivity, but times have changed. Today, the most important factor for connectivity is technology. Why Are Major Industries Using Desktop Video Conferencing Technology? Beyond enhanced communication and collaboration, many factors that promote the increased use of enterprise desktop video conferencing across major industries. Growth of Tablets - In recent years, the growth of tablet device sales has reached astronomical proportions. Not only are consumers using tablets for personal use, but also an increasing number of businesses are now using iPads and other tablet devices in the office in a variety of different industries. The crisp image resolution and portability offered by tablet devices lends itself quite well for such tablets being used to participate in web conferences. As a result, tablets are now contributing to the growth of virtual conferencing. Popularity of Video Content - Today, we live in an online world that is increasingly content driven. The simple fact is that people love to watch videos and tend to prefer video content over text. As we live in a visual culture, video conferencing has made it possible for people to communicate with colleagues and clients via the medium they prefer the most—video. Connecting Via the Cloud – Now that an increasing number of organizations are using cloud solutions for managing business networks, it has become more possible than ever for employees to connect with work and colleagues using any device. The availability of such technology has also resulted in an increase in the use of enterprise desktop video conferencing within business. This is primarily because employees prefer the option of being able to participate in conferences via their iPad, Android phone, or even work PC. If you have not yet implemented a desktop video conferencing solution in your workforce, there is certainly no time like the present. Call us at +44 (0)1925 659 523 or email us at sales@collaboration-technologies.co.uk to learn more about web conferencing and sign up for a free trial to experience the power of desktop video conferencing for yourself.